Myrtle Beach is home to over 80 fantastic golf courses, and when it came time for Golf Channel to select the site of the 22nd season of their popular reality show "Big Break", the Grand Strand was a natural selection. "Our goal is to place our competitors in pressure situations while at the same time showcase an elite golf destination. We accomplished both with Big Break Myrtle Beach and are excited to bring the series to the Grand Strand," remarked Jay Kossoff, executive producer of "Big Break". The show will make its home base at Barefoot Resort, home of four pristine courses designed by Greg Norman, Davis Love III, Tom Fazio and Pete Dye. The resort has been a favorite of golfers far and wide for years, and now its feature on The Golf Channel will spotlight these championship-quality courses. The show will also feature the Jack Nicklaus designed Pawleys Plantation course in Pawleys Island in an episode. The competition should be intense, with 12 male and female golfers squaring off against each other to take home a $75,000 grand prize, an exemption invitation to a PGA or LPGA tour event, an endorsement contract from Adams Golf and more. The winner will be determined by weekly skill events like their popular "Glass Break" challenge, requiring players to test their accuracy against targets. The competition culminates with a pressure-packed 18-hole match play round pitting the finalists against each other on the Fazio course of Barefoot Resort. 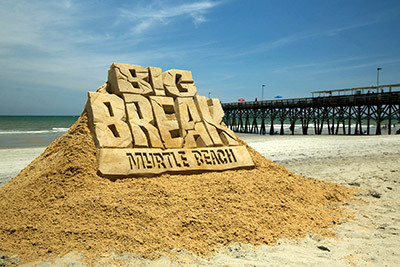 "Big Break Myrtle Beach" premieres on Tuesday, October 7th at 9:00 PM and will run for eleven weeks, wrapping up with their finale on December 16th. Be sure to set your DVR and don't miss any of the intense competition of "Big Break"! Want to play the courses featured on "Big Break Myrtle Beach"? Of course you do! And best of all, we feature great rental condos nearby Barefoot Resort, Pawleys Plantation and a host of other Grand Strand courses. Be sure to check out our specials pages for the lowest rates on vacation condos for your upcoming golf getaway!